Item #0066: Free radicals wage a war of destruction on your DNA, contributing to virtually every disease, degeneration, and aging process known to humanity today. Containing the most potent and comprehensive array of free-radical scavenging botanicals ever assembled (both fat- and water-soluble). 100% whole food and whole food extracts. No isolated or synthetic vitamins, minerals, or compounds. 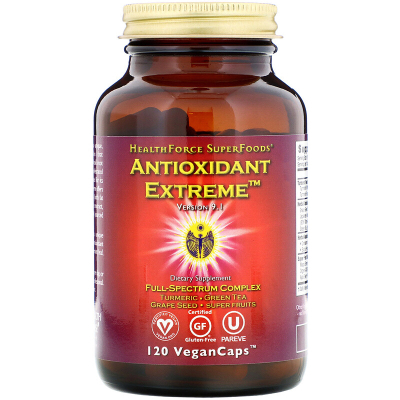 This formula has been designed to create the most potent, balanced, comprehensive, and highest ORAC (oxygen radical absorbence capacity) product possible (approximately 11,000 TE/g ORAC), and with a wide array of beneficial effects far beyond just ORAC. Unlike other formulas, focus was put on both hydro (water) and the deeply important lipid (fat) soluble antioxidants. Suggested Use: 2-4 VeganCaps per day. Not an "all or nothing." Just 1 VeganCap is extremely beneficial and more potent than other products. Take with food if you experience any irritation. Intensive Use: 8 or more VeganCaps per day, ideally spread out over 2-8 servings. Other Ingredients: None! No fillers, flow agents, synthetics or toxins.